For the 9th consecutive year, The Title Report’s Voice of the Title Agent special report provides insight into what’s really going on in your industry. This past year the Consumer Financial Protection Bureau has come under control of a new director in Kathy Kraninger, and the proposed acquisition of Stewart by Fidelity has run into a roadblock. Agents have a heightened awareness of wire fraud, as new technologies try to solve the problem, and there’s never been a more important time to hear directly from title agents. Thanks to sponsor Adeptive Software, the 20-page special report is offered as a free download. Times have changed and compliance adherence has never been more important than today. Most underwriters, title and settlement agents have established strict guidelines to ensure both they and their business partners are meeting lender and regulator expectations. Find out what this means and how technology is playing a major role in ensuring compliance for all involved in The Title Report’s newly-release New Responsibilities as a Third-Party Vendor. Protect, enhance, and grow your business with this all-access pass to The Title Report’s newly-released Title Technology special report. Hear from security experts and software giant executives on how technology can help companies ensure compliance and protect the customer’s information. This report is available as a free download. The CFPB Anniversary special report provides you an inside look into the bureau as it faces the challenge and opportunity of a new identity. Hear from the experts on how the bureau has and will continue to affect your business moving forward. Thanks to sponsor Qualia, the 16-page special report is offered as a free download. For the 8th consecutive year, The Title Report’s Voice of the Title Agent special report gives you a look inside the industry from the experts themselves – the title agents. In a year filled with change, including acquisitions, plummeting refinances, and wholesale changes at the Consumer Financial Protection Bureau (CFPB), there’s never been a more fascinating time to hear directly from title agents. Thanks to sponsors, Adeptive Software, this report is available as a free download. The Closing Commercial Deals special report from The Title Report prepares you for new opportunities as the commercial real estate market is expected to grow again in 2018. Thanks to sponsors SoftPro, the report is available to you as a free download. The Title Report's annual Title Technology special report brings you the latest information and updates on the technologies helping to improve your processes for a more efficient business tomorrow. For the 7th consecutive year, The Title Report's Voice of the Title Agent special report provides critical insight and information on the industry from the people on the ground floor - the title agents. In a year that could've gone sideways quickly, title agents reported one of the strongest years in a decade.. Thanks to sponsors, Data Trace and Adeptive, this report is available as a free download. The Title Report’s Marketing Your Title Company special report dives into the evolution of marketing in the title world and the importance of building relationships in today’s business. Thanks to sponsor SoftPro, you can download the free 16-page special report today to learn how to market and brand your business in an effort to improve its overall growth. The Title Report's annual Title Technology special report brings you the latest information and updates on the technologies helping to improve your processes for a more efficient business tomorrow. Thanks to sponsor Windward Consulting, the 2016 Title Technology special report is available as a free download. The industry changed in 2015 like few times in its history. The 2016 Voice of the Title Agent is your window into the experiences and reactions of the title agents working through those changes on a daily basis. The 20-page report provides critical insight into top issues affecting all parts of the mortgage transaction. Thanks to sponsors, Data Trace and Adeptive, this report is available as a free download. The Title Report’s Third Party Compliance Special Report steps into the world of lender vetting and regulatory compliance to help title and settlement services providers better understand their obligations and responsibilities. Thanks to sponsor SoftPro, this report is available as a free download. The Title Report's 2015 Title Technology Special Report has you covered with some of the latest title industry tech trends and tools used to work and integrate more efficiently with your customers. Thanks to sponsor Windward, the 2015 Title Technology Special Report is available as a free download. 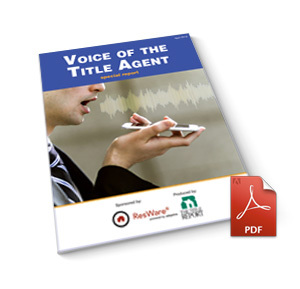 For the past five years, The Title Report has surveyed hundreds of title agents to produce the Voice of the Title Agent, providing critical insight and a common outlet to discuss top agent issues. This year, nearly 600 agents responded to the survey, making this the largest survey to date! Agents are reporting a positive outlook for 2015, but sharing concerns as well about implementation issues, increased regulations, vetting and security, and operations. Thanks to sponsor, Agents National Title Insurance Company, this report is available as a free download. In the third segment of the eTransactions series, The Title Report dive's into the eClosing process by providing an in-depth analysis of not only the benefits but the remaining obstacles facing the industry. Thanks to sponsor Simplifile, this report is available as a free download. The Title Report’s Best Practice Providers special report provides title agents with the tools and resources needed to put a comprehensive compliance program in place. Thanks to sponsor SoftPro, this report is available as a free download. In the second installment of The Title Report’s continuing eTransactions coverage we explore how to save time and increase efficiency and profitability through the power of automation. In this special report, sponsored by WINDWARD Consulting | Software - ResWare, we take an insightful look at what automated tools are available, plus, speak with automation experts and current businesses who’ve implemented automation tools on why they chose to transition, tips, techniques, strategies and their anticipated outcomes. The eTransactions special report and The Title Report aim to assist the industry by providing an in-depth look into each aspect of the electronic process. In this special report, sponsored by Corporation Service Company, we explore the first step of the electronic process – eRecordings – obtaining electronic information at the county level. For the past four years, The Title Report has surveyed hundreds of title agents to produce the Voice of the Title Agent, providing critical insight and a common outlet to discuss top agent issues. This year, more than 400 agents responded to the survey, reporting a positive outlook for 2014, but sharing concerns as well about the market, increased regulations, vetting and security, industry relationships, and operations. Each year, in the Title Technology Report, The Title Report both asks and provides answers to these questions by highlighting some of the newest solutions on the market, digging into a few tech trends and asking the insight from top experts and consultants in the field. For the past three years, the editors of The Title Report have surveyed hundreds of title agents to produce the Voice of the Title Agent Survey and provide critical insight and a common outlet to discuss top agent issues. This year, nearly 400 agents responded to the survey, reporting a largely positive outlook for 2013, but sharing concerns as well about the market, vetting and security, industry relationships, and operations. This annual special report, brought to you by The Title Report, includes reports from the top title insurance companies but also drills down on the financial stability of the title insurance underwriting world, takes a look at the current ratings, explores the market share shifts and details the title premium data. By polling small, mid-sized and national title agents, this report gauges the entire title community’s sentiments about current business pressures and opportunities, and provides insight into the operations and processes of today’s agent. This year's report contains information about the fourth-quarter and year-end financial results of the big four underwriters in the title insurance segment — Fidelity National Financial, First American Financial, Old Republic International and Stewart Information Services — and one of the larger regional underwriters. October Research, publisher of The Title Report, and presenting sponsor Windward/ResWare have teamed up to produce the third annual State of the Industry Report, October Research’s most requested special report each year. This 20-page report takes a look at each aspect of the real estate, mortgage and settlement services industry through an aggregation of stories, interviews and data brought together by the October Research staff. We hope you enjoy this special free PDF version of the 2012 State of the Industry Report. This report contains information about the fourth-quarter and year-end financial results of the four major underwriters in the title insurance segment -- Fidelity National Financial, First American Financial, Old Republic International and Stewart Information Services -- and the thoughts of a Fitch Ratings title industry analyst. Short Sales: The Good, The Bad & The Title Company is a 7-page PDF special report full of outstanding insight title agents need to know when tackling these deals. It includes expert advice, information on legal risks, tips from the field, guidance on setting-up staff and technology, ways to fight fraudulent short sales and more. Targeting Fraud will help heighten your awareness — and that of your staff — to put a stop to the rampant fraud that continues to plague the industry. You'll get expert detection tips and prevention guidance on escrow, deed, mortgage, reverse mortgage, short sale, identity fraud and more. The 28-page National Settlement Services and Compliance Summit Special Report covers ten of the 2010 Summits top sessions — as dozens of the industry's top experts and most respected names took the stage for two days of presentations, panel discussions and breakouts. Diversifying Your Title Business, a special report from the editors of The Title Report, provides 10 principles to consider before, during and after your move towards diversity. From evaluating core competencies, customers and competition to staffing and technology concerns, you'll get valuable insight to help you diversify your title business. Title Talk - What is your title agency worth? Listen to Joe Petrelli, president of Demotech, an independent financial analysis and actuarial services firm, offer insight into valuing a title agency as he discusses what attributes are most desirable to buyers, whether or not the mix of business matters and how geographic dynamics can impact the price someone may pay for a title agency. The second page of the new HUD-1 is the page that title agents and settlement service providers will spend the most time in preparation for implementation of the revised form. Here, you can download an example of the second page of the HUD-1, which includes a walk-through of the different series. Analysis of what's working and what's not working as e-mortgage initiatives evolve. Learn what title agencies are doing to stir business by taking e-closings to local banks and credit unions. Plus, also find out why e-closings are sparking frustration from some customers. Get a snapshot of some key statewide employment figures, including hourly and annual median wages. Treasury Secretary Henry Paulson and congressional Democrats hammered out a consensus on spending up to $700 billion to rescue the financial industry. Download the draft of the bill here. As an experiment to gauge the ease of shopping for title insurance at the consumer level, The Title Report employed a mystery shopper to shop for title insurance in four mid-size to large U.S. cities. Don't miss this special report as we shed light on how title agencies performed when approached by a consumer, and identify several points for discussion and future training opportunities, including customer service, education and quality control. This study, released by HUD in May 2008, presents findings on how much borrowers pay in closing costs when they buy a house, how much these costs vary, and factors to which the variation is related. Data were collected from 7,560 FHA-insured, 30-year fixed-rate home purchase loans closed in May and June of 2001on how much borrowers paid for lender or broker services, title services and real estate agent's services. The Federal Reserve's latest "beige book" review, which is released about eight times a year, said reports from the 12 Federal Reserve Districts "indicate that economic conditions have weakened since the last report. Nine districts noted slowing in the pace of economic activity, while the remaining three — Boston, Cleveland, and Richmond — described activity as mixed or steady." Get the full report here. Find out what HUD learned from a six-year study analyzing consumer reaction to the GFE. While Florida retained the top spot in the annual report, Nevada climbed to the second position. Read on to see which other states ranked in the Top 10 and what were the most common types of fraud found in 2007 originations. In an effort to significantly improve the complicated, unclear and costly homebuying process, the U.S. Housing and Urban Development released its proposed mortgage reform designed to help consumers better understand their loan terms. Read on for HUD's complete proposal. Take a look at HUD's proposed Good Faith Estimate and offer your feedback. Check out the proposed new HUD-1 forms. What do you think? Learn how to take an integrated approach to your company's compliance documentation process and help improve speed to market, reduce costs and reduce risk across the enterprise. Having trouble hooking new revenue streams? Our latest special report provides insight into how title agencies can hook new clients. First passed in 1974, the Real Estate Settlement Procedures Act (RESPA) is a federal statute enacted by the U.S. Department of Housing and Urban Development (HUD) to govern the real estate settlement process by mandating all parties fully inform borrowers about all closing costs, lender servicing and escrow account practices, business relationships between closing service providers and other parties to the transactions. When we started selecting participants for The Title Report's 2007 Leadership edition, we quickly realized the wealth of knowledgeable and passionate professionals that fill the settlement services industry. The process to whittle the list was challenging, but in the end, we were able to produce a well-rounded group that offer a personal glimpse into the state of the industry and the road it is on. A business snapshot of 400 real estate residential appraisers' feedback on questions asked about their overall business practices, turnaround time expectations, pressure to overstate a property's value and their ratings of state-administered appraisal regulations.